It keeps track of everything you’d want to know to measure your success and set benchmarks and targets you can challenge yourself to beat. Has some minor bugs. Occasionally loses GPS while other apps show a signal. 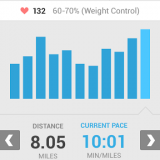 As the name implies RunKeeper is another app that tracks running and other distance activities. The app uses GPS to record your progress and report distance, speed and time. It also has some social features but is geared toward those a little more serious about their training. RunKeeper tracks and records stats for each activity you complete, then allows you to compare and measure improvement from day to day. 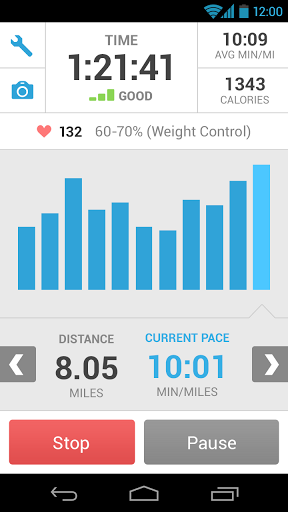 While you’re running, a digitized audio coach reports fitness stats and progress every five minutes for encouragement. 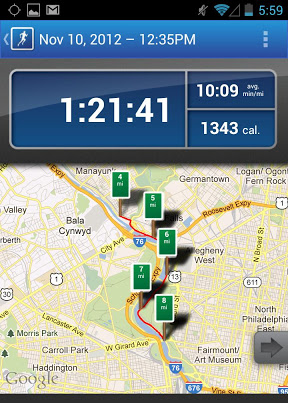 Though it’s called RunKeeper, you can keep stats for any distance activity: hiking, cycling, even snowboarding. You can use one of the predefined workouts designed by fitness professionals or use your own workout. You can set short and long term distance, time or weight loss goals. According to the developer, the app can connect to 70 other apps and Bluetooth devices including Fitbit gadgets. If social features are not important to you, RunKeeper may be a better choice over other GPS fitness apps for your personal training objectives. Of course, you’re free to download others and give each a shot before you decide if RunKeeper is a keeper. RunKeeper is free for Android devices. Like many fitness apps, there are paid training plans you can purchase individually. There is also a paid subscription for $4.99 per month (or $19.99 a year) that allows for live online broadcasting of activities, useful for friends and family to watch progress during races and marathons. Next Best Thing To A Personal Trainer?